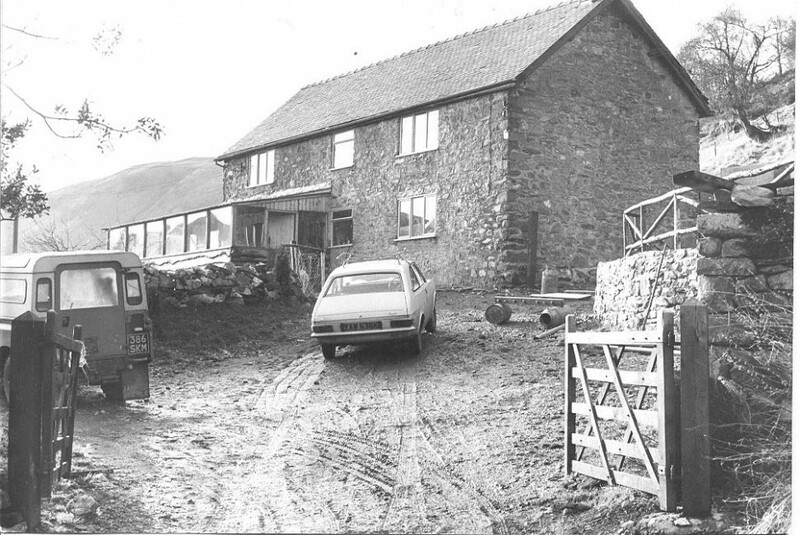 In the early 1970’s I purchased Tan-y-ffridd and moved in with Desiree and her two daughters Tania and Layla and immediately began remodelling the house and farm buildings even though it was the beginning of winter. We worked through the winter with a team of men from Llanarmon Dyffryn Ceiriog sleeping on the floor around a huge ingelnook fireplace in sleeping bags with snow drifting into the house as there were no doors or windows for a while as we replaced the old ones. It was very tough conditions but we survived and the tale of Tan-y-Ffridd began. I was the first Englishman to permanently move into the area of Llanrhaeadr but in the main we were treated well especially by the Edwards family next door who were always at hand to help with such tasks as castrating the piglets! However there was one vet who stated that we would only get second rate service as we were “just hippies”. Farming began with the purchase of our first heifer named Tany which we hand milked sitting on either side and the two girls sitting on her back..somewhat unconventional but Tany never complained or kicked over the milk bucket and proved to be a source of great amusement to the local sheepdog breeder, Dai Morris, who would arrive at milking time to stare in amazement asking whether we had seen any of his sheep to which I always laughed and said that I knew quite well that he knew where every one of his sheep were but come in and watch. Soon we had built up a herd of 8 milking cows some were used to provide milk for raising young bull calves. We made our own cheese butter and cream.The surplus milk was sold to the milk marketing board. We also made our own bread which we sold in the market in Oswestry along with vegetables eggs cheese and butter…we kept the remaining cream for ourselves! The U-Pik program was revolutionary at that time and we were the first to introduce it into the area. We grew reccurrants,blackcurrants and gooseberries and people travelled from as far away as Newtown 30 miles away to harvest our crop.